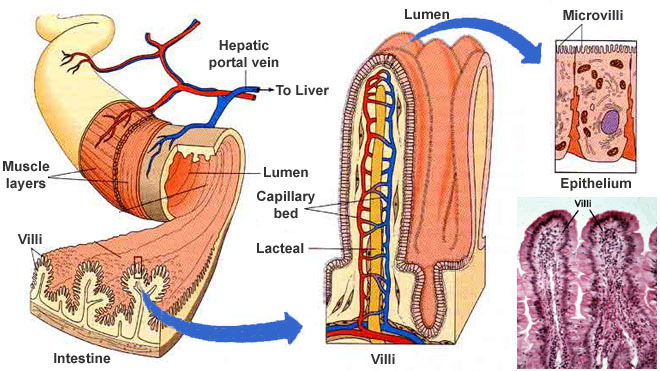 This interferes with the absorption of nutrients because the intestinal villi are responsible for absorption. Because celiacs' bodies do not produce histamine in response to gluten, antihistamines and other allergy drugs are not effective at relieving symptoms of gluten ingestion in celiacs. There is, at present, no way to relieve intestinal symptoms from celiac disease. Celiacs are not primarily treated by allergists but by gastroenterologists. On a day-to-day basis, however, a celiac's life is similar to that of someone who is allergic to wheat, rye, and barley: both celiac disease and grain allergies are treated by avoiding the problem foods. A rotavirus protein may be linked to celiac disease through a molecular mimicry mechanism and the risk of developing this disease appears to increase in children in relation to the number of rotavirus infections, in active celiac disease, a subset of anti-tTG IgA antibodies recognize the rotavirus protein, VP-7. This means, in celiacs, that the immune system appears to respond to the rotavirus protein the same as it would to a gluten peptide. Children genetically susceptible to celiac disease seemed to develop celiac disease in greater numbers after experiencing rotavirus infections than did those children who did not have rotavirus infections. Anyway rotavirus infection couldn't likely be an adult trigger celiac disease though symptoms and diagnosis of celiac disease may come late in life, because has been shown celiac disease begins in early childhood. The prevalence of celiac disease in studies of children is the same as the prevalence of celiac disease in adults and does not increase with age. There are no signs or symptoms typical for all people with celiac disease. Signs and symptoms can vary greatly from person to person. People with celiac disease often have general gastric complaints, such as intermittent diarrhea, abdominal pain and bloating. Some people with celiac disease, however, suffer no gastrointestinal discomfort at all. To make matters of diagnosing celiac disease even more challenging, celiac symptoms can also mimic symptoms of other conditions, such as anemia, Crohns disease, gastric ulcers, irritable bowel, parasitic infection, even various skin disorders or nervous conditions. It is not uncommon for celiac disease to present itself with symptoms that are far more vague. Such symptoms can include: dental and bone disorders (such as osteoporosis), depression, irritability, joint pain, mouth sores, muscle cramps, skin rash, stomach discomfort, and even tingling in the legs and feet (neuropathy). Celiac disease results in malabsorption of nutrients. Lastly, Dermatitis herpetiformis is an itchy, blistering skin disease that also associated with gluten intolerance. Rashes usually occurs on the elbows, knees and buttocks. dermatitis herpetiformis can also cause significant intestinal damage identical to that of celiac disease. However, people who suffer from dermatitis herpetiformis may also be entirely free of noticeable digestive symptoms. Treatment with a gluten-free diet, in addition to medication to control the rash, usually brings about significant improvement. For anyone with a family history of celiac disease or of disorders such as thyroid disease, anemia of unknown cause, type I diabetes or other immune disorders or Downs syndrome, doctors may suggest routine screening. Otherwise, patients are generally screened on a case by case basis according to individual symptoms. People with celiac disease have abnormally high levels of associated antibodies, including one or more of the following: anti-gliadin, anti-endomysium and anti-tissue transglutaminase, and damage to the villi (shortening and villous flattening) in the lamina propria and crypt regions of their intestines when they eat specific food-grain antigens (toxic amino acid sequences) that are found in wheat, rye, and barley. Antibodies are the specialized proteins the immune system uses to break down and eliminate foreign substances from the body. In people with celiac disease, the immune system treats gluten as a foreign invader and produces elevated levels of antibodies to get rid of it, causing symptoms and associated discomfort. A blood test, such as anti-tissue transglutaminase and anti-endomysial antibodies, can detect abnormally high antibody levels, and is often used in the initial detection of celiac in people who are most likely to have the disease, and for those who may need further testing. Since the immune system of a person with celiac treats gluten as a foreign substance and increases the number of antibodies, elevated levels of these antibodies are a sign of celiac disease. To confirm the diagnosis, your doctor may need to do a biopsy, that is, microscopically examine a small portion of intestinal tissue to check for celiac associated damage to the small intestine. To do this, your doctor inserts a thin, flexible tube (endoscope) through your mouth, esophagus and stomach into your small intestine and takes a sample of intestinal tissue to look for damage to the villi (tiny, hair-like projections in the walls the small intestine that absorb vitamins, minerals and other nutrients). In general, all the potential complications described are either reversible or avoidable by complying with a gluten-free diet. With specific regard to reduced bone mineral density, following a gluten-free diet may either maintain or improve the density. Anemia is the most common hematologic abnormality of celiac disease, with a prevalence ranging from 12% to 69% at diagnosis, and may represent the first manifestation of a subclinical disease. Most cases of anemia (81%) are related to hematinic deficiencies (iron, folate, vitamin B12) that occur as a consequence of intestinal malabsorption. In these conditions an increased production of inflammatory cytokines can directly inhibit erythropoiesis, interfere with erythropoietin production and induce changes in iron homeostasis characterized by reductions of both iron absorption and macrophage iron release. Anemia is defined by a hemoglobin (Hb) concentration <13.0 g/dL in males and <12.0 g/dL in females according to the WHO. Iron-deficiency anemia is characterized by the presence of anemia associated with low serum ferritin (<10 ng/mL for females, <15 ng/mL for males) or with a transferrin saturation <16% together with serum ferritin levels <30 ng/mL. The diagnosis requires the presence of reduced transferrin saturation (<16%), normal/reduced serum transferrin with normal/high serum ferritin (>100 ng/mL). The association of transferring saturation <16% with normal/reduced transferring and a serum ferritin 30 ng/mL, but 100 ng/mL, defined a group of patients who possibly had a combination of iron deficiency and chronic disease as pathogenetic mechanisms of anemia. Long standing celiac disease is associated with an increased risk of malignancy. Iron has the ability to cause free-radical damage to DNA. There is also a relationship between ferritin and cancer: despite the lack of an increase in iron stores, the serum ferritin level is significantly increased in patients with a variety of neoplasms. Tumor cells generally contain lower quantities of iron-poor intracellular ferritin. Some neoplastic cells exhibit markedly altered ferritin composition or content compared with normal cells and it is intriguing that c-myc12 and the potent E1A oncogene13 transcriptionally regulate ferritin-H chain expression. At least some oncogenes modulate ferritin synthesis, and these results may explain the changes in ferritin concentrations observed in many neoplasms. Analisi di associazione "genome-wide" hanno consentito di identificare, tra i fattori di rischio della celiachia, alcuni polimorfismi genetici (snp) che risulterebbero correlati all'espressione di alcuni geni del sistema immunitario. L'indagine, pubblicata su Nature Genetics e condotta da David A van Heel e collaboratori del Blizard Institute of Cell and Molecular Science, Queen Mary University di Londra, ha riguardato oltre 4.500 individui celiaci e 10.750 soggetti sani. In breve, specifiche varianti genetiche, presenti in 13 nuove regioni genomiche, hanno raggiunto una significatività "genome-wide" elevata (Pcombined < 5 × 10-8). La maggior parte di queste regioni conteneva geni codificanti molecole con funzioni immunitarie (Bach2, Ccr4, Cd80, Ciita-Socs1-Clec16A, Icoslg e Zmiz1), con Ets1, Runx3, Themis e Tnfrsf14 aventi ruolo chiave nella selezione timica dei linfociti T. Una meta-analisi, riguardante oltre 1.400 campioni di sangue di celiaci, ha consentito di evidenziare che il 56% dei loci genici testati contiene fattori di rischio della celiachia con funzione di regolazione dell'espressione genica.